1. Mustard blouse – Pretty silhouette and love the color. Always on the lookout for good work blouses. 2. Fair Isle sweater – Love the pretty colors and cute print. 3. Pale pink shirt – I’ve been seeing a lot of pale pink everywhere. A flattering relaxed fit one would be a fun & versatile way to introduce the color. 4. Camel coat – Very Olivia Pope. ‘Nuf said. 5. Plaid scarf – I’ve been wearing my colorful blanket scarf everyday and have gotten so many compliments on it. I am not thinking I should get a more neutral print scarf to alternate with. 7. Windowpane blouse – I love the windowpane print but don’t own anything that has it. I feel like I’m finally going wait and wait and wait to get something like this blouse and then two minutes after I buy it goes out of style. 8. Shift dress – I have so many summer dresses but not that many winter ones. This seems like a really cute option. 9. 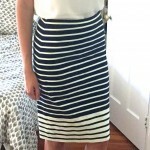 Sheath dress – Love this for work. 10. Trench coat – Affordable option instead of my dream Burberry trench. 11. Wrap blouse – Another possible good work blouse. 12. Plaid shirt dress – Ditto to above in possible cute winter-ish dress. I have the windowpane blouse from Old Navy and am really happy with it! It wear it untucked with leggings and skinny jeans (I think I sized up), and it looks cute on its own or under a black, grey, or off white cardigan. Mine is too roomy, or I'm too short, to tuck it in like in the photo. I saw a windowpane blouse at The Limited this weekend! I couldn't find it online when I just looked though. I love my windowpane blouse from Old Navy too! I am petite (5'2″ 110 lbs) and have it in the XS like all my shirts from there. I like to wear it casually with jeans and a colored scarf (my favorites to pair it with are my red, yellow, lavender, and cobalt…yes I have essentially every color of the rainbow when it comes to pashmina scarves thanks to Charming Charlie) or tucked into a black skirt with a red scarf. It looks really great paired with tall boots too! Thanks for the tip! I found one I really liked at Old Navy and bought it.